Monday afternoon to Friday am. A Painting Holiday break in beautiful Devon, visiting and painting gardens and scenic places. In late summer the countryside and garden palette takes on a warmer hue; perennials mix with dahlias and exotics in a late burst of colour, the warm oranges and reds of fruits and squashes adorn the vegetable beds, and foliage starts to add autumn hues. This is a studio and location based course which introduces and practices skills which will help you to create successful garden or landscape paintings. 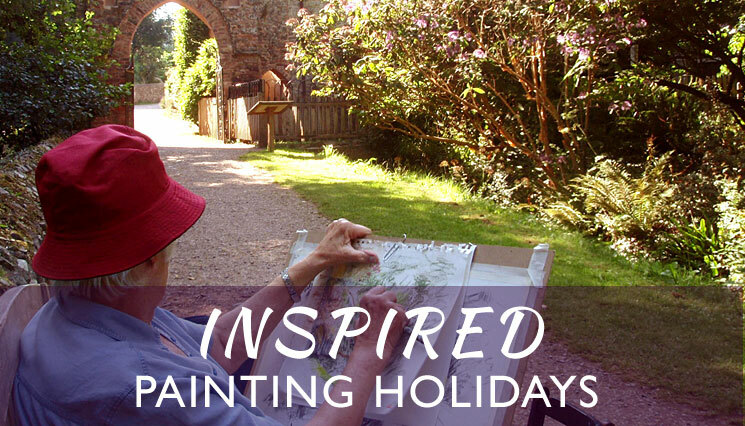 We aim for a full day out in some of the beautiful garden or scenic spot in the area, using them as inspiration for sketching and painting in the studio. The timetable runs from Monday evening to Friday morning. You learn skills for working outdoors and composing a picture with a gradual introduction to working from outdoor subjects. We will cover sketching, tonal values and composition, negative painting and colour mixing. Students bring their preferred choice of painting medium and receive individual advice on use of materials and painting skills in watercolour or pastel; you may wish to use the opportunity to try out a new medium with a tutor to guide you. Materials Please bring sketching materials including charcoal, sketchbook, andyour choice of painting medium. Also recommended- protective clothing for painting, suitable footwear and clothes for outside work, including waterproofs. Digital camera. Folding stool if needed. More detailed information about materials and equipment is sent out shortly before the course. You may already have all you need to get the most out of your holiday - we encourage you to contact the artist for more advice, so that you don’t leave behind things that you will find useful, and to avoid expensive purchases which may prove unneccesary. Other costs Student's lunch/refreshments on visit days. We are surrounded by beautiful gardens many owned by the National Trust or with reduced price entry for RHS members, so bring your membership card if you have one. Bampton is 12 miles from M5 junction 27 and from main line train services at Tiverton Parkway, with direct trains to many locations (e.g. London Paddington- 2hours, Birmingham New Street 2.25 hours). We can arrange to collect students travelling by train or coach from Tiverton Parkway Rail Station or Tiverton Coach Station.